When replacing the green led with a red(for pure esthetic reasons only...) I noticed that the led does not respond perfectly to the envelope. It is noticable when having long release times, the led stops emitting light abruptly, before the sound stops. I guess it has been like this from the beginning but I never noticed it before. Is there something I can do to improve the responsiveness? I tried changing the value of R10, but it didnt seem to do anything (except obviously changing the brightness). Some issues of the VC-ADSR PCB, not the current one, have the LED simply connected, via a resistor, to the output of the ADSR core and 0V. This means that the red LED will not light when the core output voltage drops below 2V. In those versions of the PCB the core rises to 8.2V at it's peak, so the LED does not light when the output voltage of the module drops to around 1.25V. 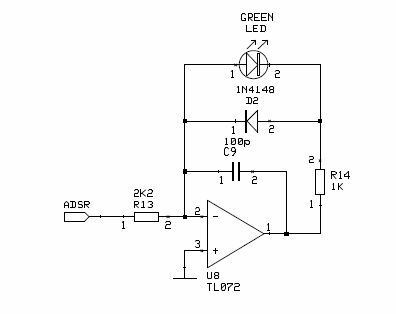 Green LEDs have a slightly higher voltage requirement and therefore drop off even sooner as you have noticed. Some early versions and the most recent issue of the ADSR PCB use a current driver for the LED and so the LED is always lit except for when the output is at 0V. It is not a trivial task to add this circuitry to those versions of the PCB that have only the resistor. Sadly there wasn't enough room on those PCBs to include the current driver circuit. The op-amp needed was used for the optional inverting ADSR output which is now no longer used. Mine is issue 4 and I see what you mean when looking at the schematic. Would it be possible for me to take a look at the schematic of the current driver circuit? Maybe I could build the circuit on a protoboard and just add it to the pcb. R13 is designed for a 5V raw ADSR signal on issue 5 boards but may be increased to 3K6 to give a similar brightness on issue 3 & 4 boards. Thats great - I will try that. Thank you again for taking the time to help me out with this! I did the mod and it was successful - the led respons was perfect, but after replacing the led a few more times to try different colours, unfortunately it suddenly kept emitting light constantly no matter if there was a gate signal present or not. I also noticed a hint of burned smell and that U1 was getting really hot. I have examined the board closely for shorts etc. around all ICs and around the mod but can't find anything suspicious at all. Any help or directions for what might have caused this problem is highly appreciated! If U1 is getting hot it's probably dead and needs replacing. Why that should die when testing different colour LEDs I don't know, since U1 is well away from the analogue outputs. Perhaps there was a small bit of wire left on the bench surface that got caught up in something? Either way I think you'll need a new 4001B and it might be worth trying a different 4052B as well. Make sure you haven't used a 74HC4052 for U2. They can work for a while and then die taking out U1 as well. So I replaced U1 and U2 and the module is back to its former glory! Guess I need to be more careful in the future(and keep my workbench clean)!